I imagine that all of you who stop by Boston Handmade's online home are interested in supporting local, Do-It-Yourself entrepreneurs, right? And if you are reading our blog, then you are most likely someone who reads multiple blogs and is always up for learning about new ones, yes? Well how about discovering some local, Boston-based blogging entrepreneurs? When I thought about the number of great Boston-based blogs I knew of, I thought it'd be great to share them with you in a short series on the Boston Handmade blog. Honestly, I'm rather new to the blogging universe so you have probably heard of some of the blogs I'll be writing about but I hope to throw some new ones in for you all. I really enjoy supporting anything made locally--even blogs! First up, Design Boston and New Brahmin. Both blogs report on Boston-specific fashion and design. The information below was taken from each site's About page. Boston is a city with a unique mixture of historic tradition and modern development. Within this environment lays a vibrant community of architechts, designers, and artisans continually creating new and exciting works. DesignBoston is here to help anyone interested in design find all that Boston has to offer. 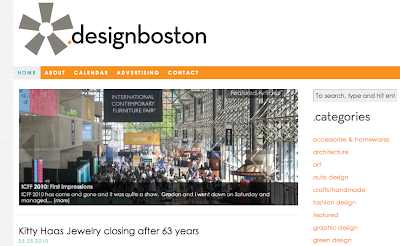 Since 2006, DesignBoston has been the source for news about the people and projects, events and spaces that are shaping Boston's design scene. New Brahmin creates a much-needed home for fashion, style and shopping news in the Boston area. 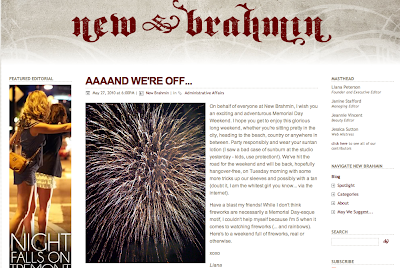 With multiple daily updates, New Brahmin promises to offer quick, intelligent stories that are informative, witty and occasionally bitchy (hey, it comes with the territory). Its contributors are active in various parts of Boston’s fashion community and look to unite and inspire like-minded readers. thanks for sharing these blogs! Supporting local is always a good thing! Thanks for the comment, Lisa :) And thanks for thinking local first!